Something that quite few people know is that beer, in it's earliest form, was first recorded in ancient Egypt. The beer back then was made when grain was added to water and the natural yeast in the air made it ferment. It probably didn't taste great and the alcohol percentage would have varied massively depending on conditions. 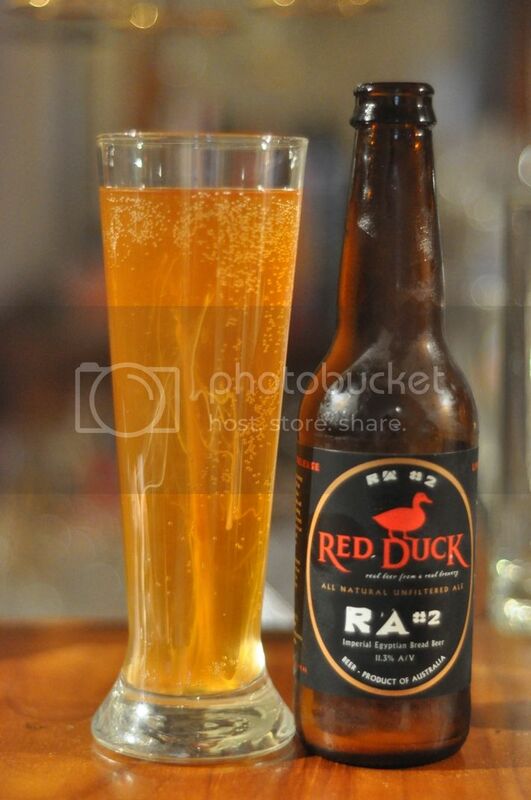 This is where Red Duck step in with their Ra #2, an Imperial Egyptian Bread Beer, with the aim of recreating this ancient style of beer while still putting their own unique spin on it. In Egypt they quickly became aware that if bread was placed in water it made better beer that grain did, to the point where they made bread specifically to make beer! Red Duck have done the same, I can't wait to see the result! Ra #2 certainly isn't your standard looking beer! It appears to have almost no carbonation and as a result no head. The beer's colour is a really odd almost orange colour and there are trails of yeast that hang throughout. It's fair to say this is one of the strangest looking beers I've seen, but what was I expecting with a beer based on a 5,000 year old concept? The nose is also unique. There is plenty of honey and orange as well as something that smells similar to sultanas. I can also smell plenty of the sour yeasts the boys made from their last attempt at an Egyptian bread beer. It's actually quite similar to the nose of a fruit cake, if not a slightly weird one. I did also like the comment my girlfriend made upon smelling it; that it smells like "salty (read sour) berocca." I'm finding it really hard to decide whether I like this beer or not, however I think I'm leaning towards liking it! It's one of the strangest beers I've ever tasted! But as it went on it sort of grew on me and the salty orange flavour actually became quite nice. I would certainly recommend this beer as a one-off, especially if you are interested in the evolution of beer from where it began to where it is today.